Liveblog: We're Live at Apple's iPad 2 Press Event! 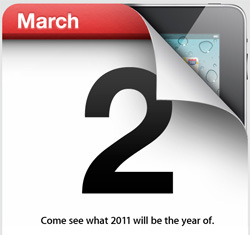 What’s new in the iPad 2? What else does Apple have up their sleeves? We’ll be bringing back all the details with our up-to-the-second liveblog, which will begin at 10 A.M Pacific (1 P.M Eastern) on March 2nd. If all goes well, we’ll start piping in with color commentary and photos from the scene a bit earlier than that. Be sure to bookmark this page and tune in early so you don’t miss a thing!